The net has already started buzzing about the netbook with a Google " Chrome " OS. Chrome operating system is the search giants attempt to develop a Cloud oriented Operating system. The chrome OS netbooks are going to make their debut on June 15 into the markets. Why I say this is just another net book with Google flavour? Because Chrome OS does nothing like a Desktop OS except that both have a browser :P... You can only run your web based applications with the help of advanced Chrome browser.Since there is nothing for the OS to really do, starting up such a netbook will just a tip of a minute . If you ask me about the applications , the focus obviously is on the Google based applications ( Google docs , Gmail blah blah ). Well Google has really thought of a futuristic idea where they expect web based applications to server just like the desktop applications do today. They just wanted to facilitate this with the help of their Chrome browser.This open release of the software is known as Chromium OS – a play off the Chrome browser’s name. Which notebooks will have Google Chrome OS ? What is the cost of Chrome Notebook ? How is the hardware of Chrome notebook ? Eventhough Chrome does not run a desktop OS , dont expect it to be as thin as a MacBook Air :). Its a bit thicker and has more weight than the Mac. People complained about a feel of the panels as well but it depends on the manufacturers. 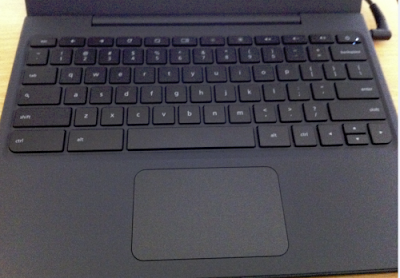 The keyboard is a stripped version of normal laptop keyboard. There are no function keys. There are hard buttons to do things like go forward or backwards. The CAPS LOCK button has been replaced with a Search button. Can I buy a Chrome notebook ? If you want to show it to a couple of friends , I will say a Yes. Else wait for sometime to see the evolution. Everything it has been constructed for is still in evolution. Cloud has to go a long way to see everything on it. The could be more features installed into these notebook s based on feedback and with time . But it seems a little useless. If you think about it, computers are meant for you to be personalized. Without Microsoft Word, Excel, OneNote, etc., how are you going to save your school work? In addition, I see no point of buying a $500 notebook just to browse a net. Why not buy a netbook (with so much functions) and download Google Chrome? You would save your work on the CLOUD. cloud computers are designed to store everything on the cloud. so with out word, excel, OneNote, etc. you would use the google apps, and save them to your google account, then not only could you access it from your google book, you could also access it anywhere. which is better than storing things locally. The 500$ price tag lies in a shift in idealogy. It was designed for the internet.It provides the fastest access to the web of any mobile device. It boots in a little under 10 seconds (45 second boot on a macbook pro/air) It also come 3g/4g ready and has epic battery life. In other words: Its all about the 'net, dude. Only thing i don't like about this idea, is that google will really own our souls soon. first your netbook, then your souls. If you want Chromebook to 'look and feel' like Windows, check out this news at http://ow.ly/5mQGX. "ZeroPC Turns Google Chromebook into a Fully Featured Web Desktop with Familiar Windows-like Desktop User Interface"
This seems like this has a lot of potential. But I can't help but think of other motifs for this. Google Chrome browser sends your browsing history back to google so ads can be better placed. More ad money for them and better ads for us. If you run an internet speed test with chrome vs another browser. Chrome upload speeds will always be slightly slower. I just hope it won't affect everyday browsing. Other than that. I want to know if I can get the "chrome os" by itself. what if I wanted to dual boot my wi-fi enabled laptop so I can just access the internet? is that even possible? Or is there a restriction to what kind of hardware a netbook can have? would the OS not know what to do with a normal laptop that's been upgraded? How much freedom do I get with this product? I think this is really working on the road the withe new google chrome book review. Chromebooks are targeted to specific types of users that want an easy to use, Internet-friendly browsing device. They are not meant to replace the traditional PC or laptop. In addition, there are third party apps out there that can bridge the gap for Chromebook users that require occasional access to those tools found only in a Windows environment. For example, if a Chromebook user needs quick, easy, temporary access to a Windows desktop or Windows app, they can use Ericom AccessNow, a pure HTML5 RDP client that enables Chromebook users to connect to any RDP host, including Terminal Server (RDS Session Host), physical desktops or VDI virtual desktops – and run their applications and desktops in a browser. When the chrome box claims 30,000 foot wi fi access are they talking flying applications or source on ground ? I think the most important thing a person should know about chrome is how the files are stored and the internet dependency. I was planning to get the samsung chromebook until I found a good deal on the samsung np540u4e-k01us. Now I have a traditional laptop that isn't limiting my use. As a review, its a good one to share. Very helpful to know the reason behind those chrome book. Dary Web Designs is a leading Website design and development company in Kuwait that offers SEO Web Marketing, Branding, Mobile Application, Hosting etc. Good to this development ad achievements you have accomplished these years. Keep it up. Thanks for sharing this post in your blog.